When the Altiplano was first conceived and released in 1957, this record-breaking feat of slenderness revolutionized the world of watchmaking. More than a show of technical virtuosity, Altiplano defined a new set of aesthetic rules and a brand of elegant classicism that endures 60 years later. 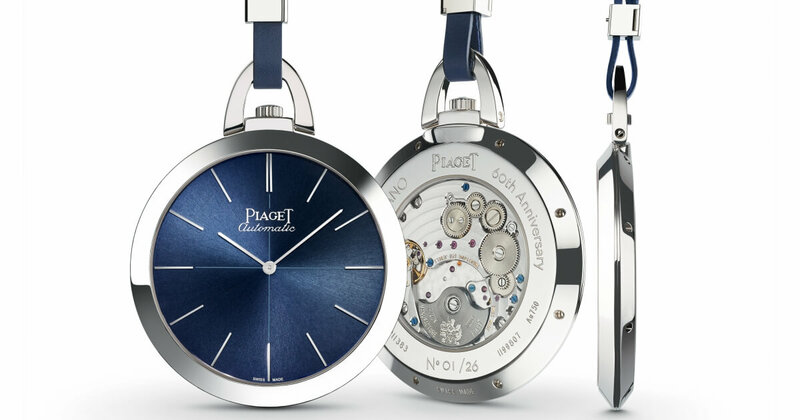 As part of the yearlong celebrations dedicated to this watchmaking icon, Piaget puts an unexpected twist on a timeless classic: the ultra-thin timepiece takes leave from its owner's wrist to become an original pocket watch. 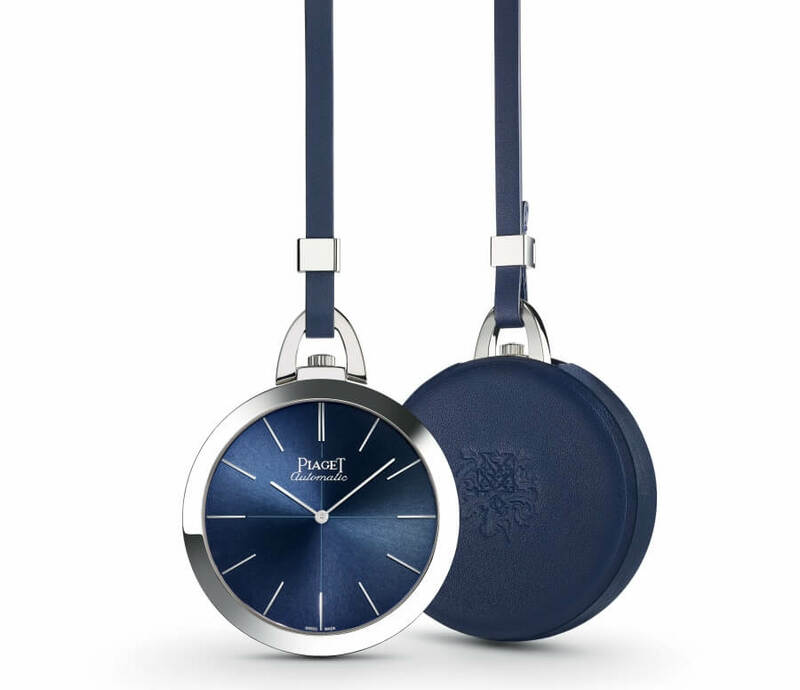 Set on a blue calfskin string to match its Piaget blue dial, the limited edition Altiplano 60th Anniversary Pocket Watch makes an original companion for the watch collector, the style maven or the classic dandy. When displayed on a specially designed marquetry stand, the legendary Altiplano is more than a watch; it becomes a piece of art, a timeless expression of elegance. While resolutely discreet and never ostentatious, the Altiplano somehow always makes a statement of style. Attached to a blue calfskin string, the pocket watch balances classic sophistication with a touch of contemporary audacity. Delving back to the design codes that put the legendary watch on the map in 1957, the Altiplano 60th Anniversary Pocket Watch takes its inspiration from the very first ultra-thin watches of Piaget in the late 50's. The captivating blue of the sunburst dial is somewhere between cobalt and midnight blue. The rich deep shade of blue is paired with white gold slim single hour-markers and the slim baton-type hands that are typical of the Altiplano collection. Reinforcing the perfect proportions of the watch, a fine blue cross once used in the earliest versions of Altiplano, gives the face its understated and balanced elegance. The historical Piaget logo that decorates the dial is a reminder of the first Piaget Altiplano and the ultra-thin watchmaking traditions nurtured by the Manufacture de Haute Horlogerie where each piece is developed, produced and decorated. Inside the slender case is an equally slender 1200P movement, the ultra-thin self-winding mechanical movement at just 2.35mm thin. The sapphire case back reveals the duality of Altiplano: pure simplicity on the outside, sophisticated complexity on the inside. The beautiful finishes of the watch exemplified by the circular Cotes de Geneve, bevelled bridges, circular-grained mainplate and blued screws can be admired from the back. 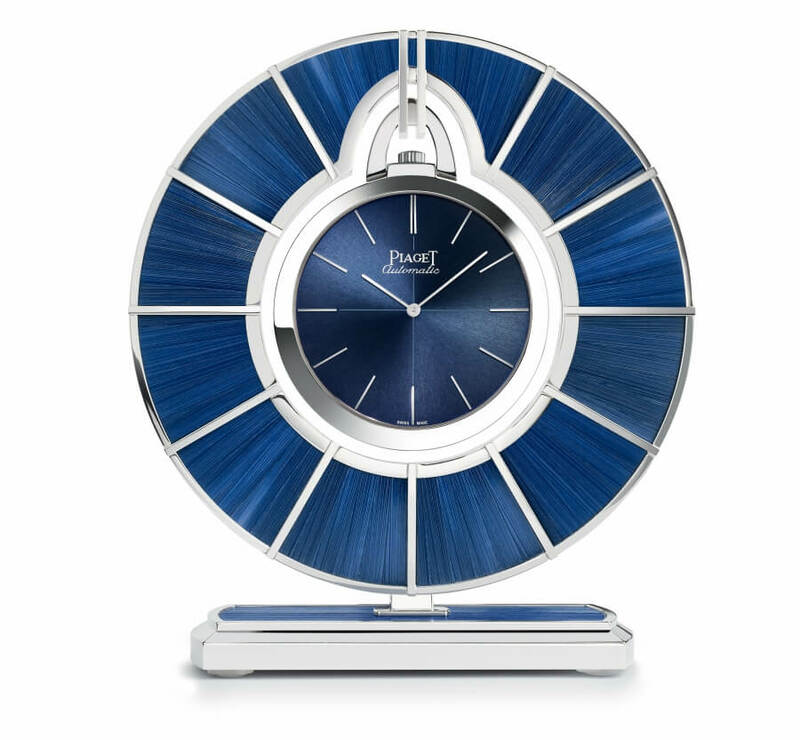 An homage to the creativity of the Altiplano, the pocket watch can be transformed into a beautiful table clock when placed in the centre of an elegant blue marquetry stand punctuated by sleek markers. The elaborate straw marquetry on the circular frame is the result of craftsmanship similar to wood marquetry. With the greatest skill, the artisan selects the pieces of straw based on to their colour shade to perfectly interpret the contrasts, colour and texture of the design. In order to match the dial, precision is paramount as every piece has to be accurate to a hundredth of a millimetre. From breaking records of slenderness with breathtakingly thin movements to evolving its appearance with new materials and colours, Altiplano is always an original. Limited to just 26 pieces, the new Altiplano 60th Anniversary Pocket Watch demonstrates this icon's ability to reinvent itself without every straying too far from the design codes that have made it the epitome of elegance for the past six decades.